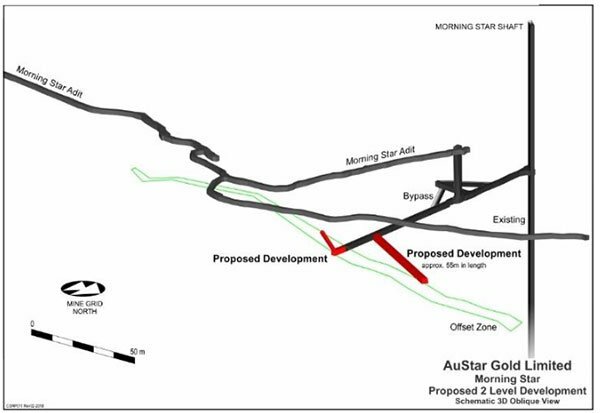 Since making a series of divestments last year, Australian gold explorer AuStar Gold Limited (ASX:AUL) has narrowed its focus on a return to production of the Morning Star Project in the Victorian goldfields, which includes the highly promising Rose of Denmark mine. The Morning Star mine is the more advanced of the company’s two mines in this area, while Rose of Denmark is the company’s medium-term play, which has seen a lot of positive drilling in the last few months. 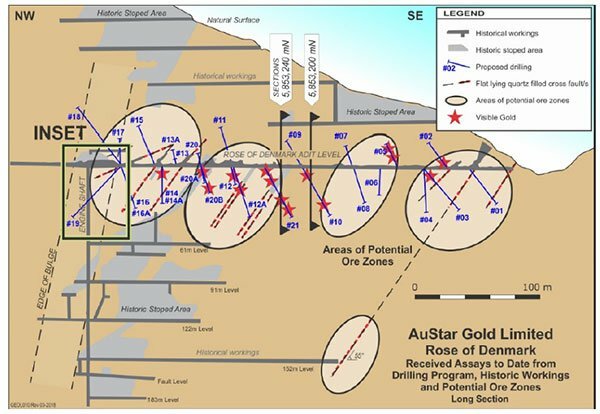 AUL has released significant high-grade gold results from its Rose of Denmark mine in Victoria’s Eastern Goldfields — its fourth set of high grade gold assays since January from its drilling program. The encouraging results are a boost for AUL as it looks to identify additional areas of gold mineralisation in the mine and payable gold zones that were previously thought to be uneconomical by early miners. The latest results provide the company with increased confidence in its strategy to develop multiple ore sources in the prolific mining region. It also provides further justification to developing a bulk sample at the mine. The aim of the bulk sample program will be to determine the strike length of the ore zones as well as a more accurate gold grade of the payable runs, given that nuggetty gold regimes generally produce an upgrade in the grade of the gold when compared to the results gained just from diamond drilling. It should be noted here though, that this is an early stage play and investors should seek professional financial advice if considering this stock for their portfolio. It’s been a busy time for this emerging gold explorer. AUL is now singularly focused on high quality gold projects, having low-cost, short start-up production capability. Which brings it to Victoria, a globally significant gold producing region. Gold fever struck the remote Australian colony in the 1850s, and more than 2,400 tonnes of gold production has been recorded since this time. This represents approximately 2% of the world’s gold production. Over at the Morning Star mine, progress to trial mining at the rehabilitated mine’s Stacpoole zone has been generating interest. The company acquired this mine and its large tenement holding in 2015. It is an advanced high-grade gold project with significant infrastructure including processing plant. Work to recommission the processing plant is almost complete. No major issues have been identified that should prevent processing the mined materials from the Stacpoole zone. Each individual processing component is being tested. Once completed, the plant will be tested using low grade material. There is plenty of upside for this company; the region offers opportunities in established gold fields and modern mining technology and techniques make it an attractive prospect. In addition, an ongoing interest in gold – as a proven global currency during uncertain times – is driving the rush for this highly-prized metal. Many mines that didn’t stack up economically in the past are now attracting attention from junior explorers. Of course, it is early stages in the drilling program and investors should seek professional financial advice if considering this stock for their portfolio. AUL has a bold vision to be the next mid-tier Australian gold producer. The company is focused on the acquisition and return to production of low entry cost, idle gold mines at a time of strong gold prices. When we last looked at AUL in February, the company had announced its new name and a priority focus on the high-grade Morning Star gold mine and adjoining tenements. The symbolic change signified the company’s renewed focus and strategy, and reflected the results of a turn-around phase for the company. This chapter involved building an experienced board and management team and disposing of non-core assets. Since then, AUL has released its Half Year Financial Report, for the period ending 31 December 2017 followed by the progress update on trial mining at Morning Star. Now let’s take a closer look at the assets. 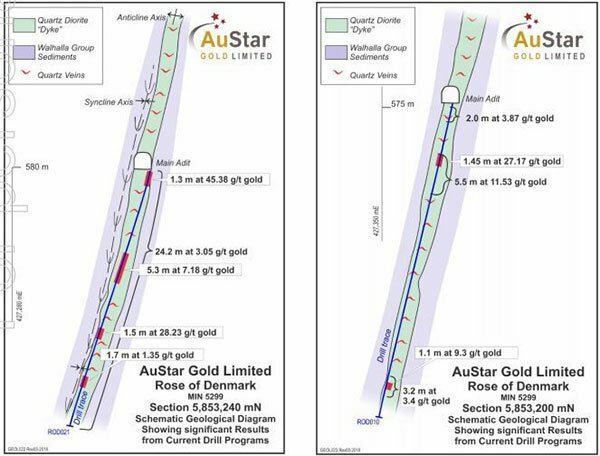 In late March, AUL announced that the drill program at Rose of Denmark continued to deliver significant results, following updates from earlier in the year. The current drilling helps the company with a clearer picture of the geology and structures controlling the gold mineralisation. Significant runs of anomalous mineralisation were observed in the drilling. This is very encouraging as the early miners deemed the dyke bulge as uneconomic and it is possible that an economic ore block could exist within the bulge based on bulk mining costs available today. It is likely that a bulk sample program will be required in the near term, to determine the strike length of the identified ore zones as well as the likely grade of payable runs. This is of particular interest given that nuggetty gold regimes generally produce an upgrade from diamond drilling. You can see visible gold in the picture below. 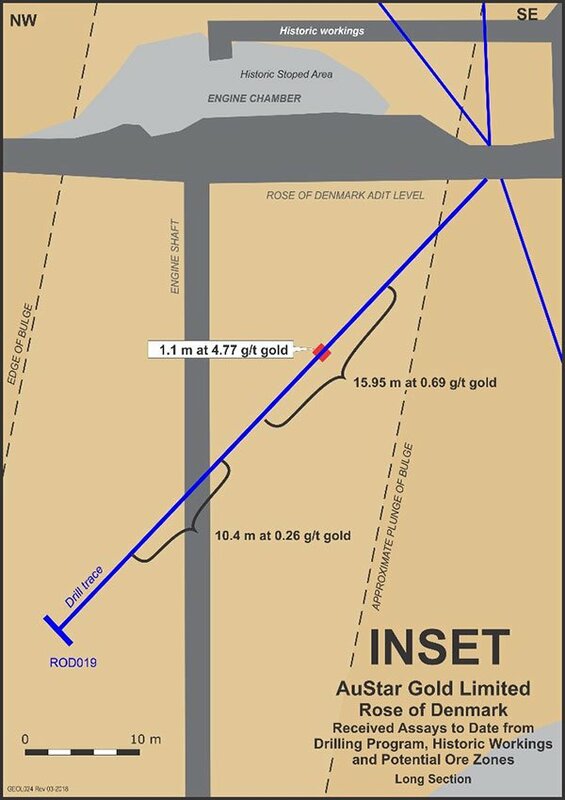 Historical gold production at Rose of Denmark totalled approximately 37,000 ounces at 12.5 g/t and was sourced from both within the near surface adit and from a deeper production shaft of around 200m deep. The Rose of Denmark mine stopped production in 1926 and was dormant until 2012. Most gold mineralisation in the Woods Point to Gaffney’s Creek corridor occurs as structurally-controlled quartz ladder vein systems hosted by dioritic dyke bulges. Rose of Denmark exhibits all of these characteristics. 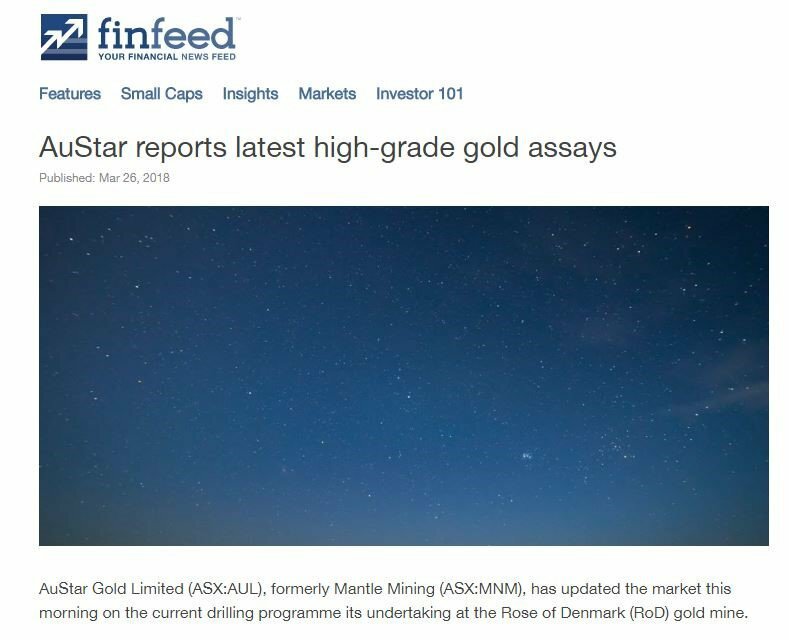 While Morning Star appears to be the main prize in the region, the ongoing positive results at Rose of Denmark confirm AUL’s belief in the prospectivity of this mine. However the stock remains speculative and investors should approach their investment decision in this company with caution. Let’s see the highlights from exploratory drilling at Morning Star. The company has reached an enthusing juncture with both the rise and level heading entering the Stacpoole zone. Next up, they will expose a length of the zone with the aim of mining an area of the Stacpoole zone. Imminent exposure of the Stacpoole zone means that the onsite gold processing plant is now being inspected, tested and recommissioned, ready to receive the ore from the trial mining. Restarting the process plant has been timed to coincide with the development exposing the Stacpoole zone. All electrical circuits and motors in the plant, as well as all valves, electrical and pneumatic controls to individual units are being tested. Before processing high grade ore, geologists will run low grade ore through the plant to ensure optimum recovery. Development in the Northern rail heading has entered a highly oxidized, highly altered and partly brecciated rock type, which is interpreted to be the margin of the Stacpoole zone. Several quartz vein sets and faulting are also present. Work will continue across the full zone to identify the strongest gold-bearing structure. Concurrently, the Eastern Rise has developed into the footwall of the Stacpoole zone. 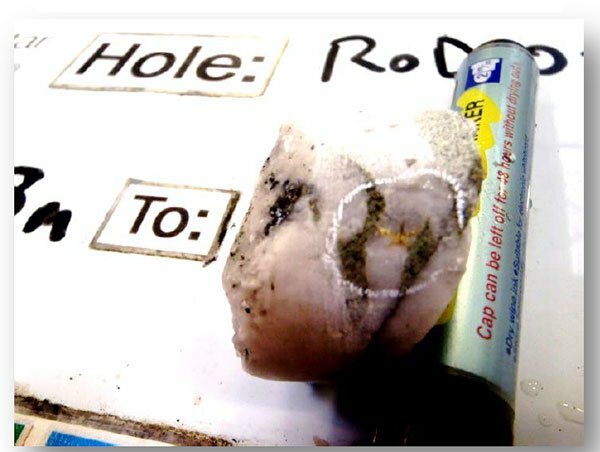 Once Stacpoole zone structures are confidently identified, sampled and assayed, designs can then be undertaken to place mining on the highest-grade structure from the level to the newly developed rise. Geologists have been rostered on a continuous basis and are mapping and sampling every new face as the mining progresses. Laboratory assaying for accuracy supports the immediate assessments at the mine. However, laboratory results are often delayed due to transport logistics and commercial laboratory processes. The mine is approximately 120km east of Melbourne. This area has a rich history. The discovery of gold here goes back to the gold rush along the Goulburn river where miners worked their way south from Jamieson to Gaffney’s Creek in 1860. The mine has historical production of 830,000 ounces of gold at an average grade of 26.5 g/t gold. AUL sees significant discovery potential from both mines. All in all, the results are encouraging and there is more on the horizon. Gold exists in greater abundance in Australia than any other country in the world. Australia is a key player in the global gold industry. It is the world’s second largest global producer after China, and is a large contributor to the global gold trade with exports valued at more than $16 billion annually. What makes gold so attractive? Gold’s unique properties are highly sought after. It is malleable, ductile, highly conductive and chemically inert. Gold is mined, refined and sold to many industries – for jewellery, electronics, nanotechnology and investment. And because gold is valuable and does not corrode, it has a vibrant recycling market. 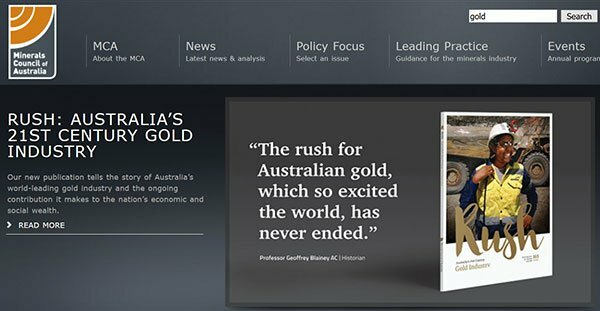 Demand for Australian gold is at a 10 year high; it is a good time to be looking for gold. And with what AUL expects to find, they could well tap into this demand. 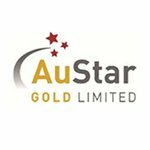 With the name change late last year, AuStar Gold invited shareholders to take the company into a new era that reflected its new focus. Although it still has a long way to achieve its ambitions and investors should seek professional financial advice if considering this stock for their portfolio. AUL’s vision of generating significant value in the gold sector is right on track. Geological wins at Morning Star and the Rose of Denmark provide a golden opportunity for this Australian producer. With plenty of catalysts to come, let’s see what the next few months might hold for investors.